1906 J. Stuart Blackton made the earliest surviving example of an animated film - a 3-minute short or 2D cartoon called Humorous Phases of Funny Faces (1906). It was the first cartoon to use the single frame method, and was projected at 20 frames per second. In the film, a cartoonist's line drawings of two faces were 'animated' (or came to life) on a blackboard. The two faces smiled and winked, and the cigar-smoking man blew smoke in the lady's face; also, a circus clown led a small dog to jump through a hoop. 1906 The world's first true feature-length or narrative film at 70 minutes in length, director Charles Tait's Australian film The Story of the Kelly Gang (aka Ned Kelly and His Gang) (1906), premiered in Melbourne, Australia on December 26, 1906. It was the longest narrative drama seen there and in the world. The showing of the film was accompanied by an orchestra, sound effects, and a narrator. 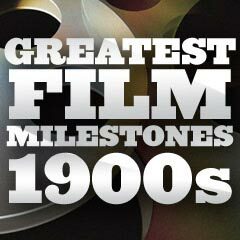 When the popular film was screened in England in 1907, it was claimed to be "the longest film ever made." The film told about Australian popular culture icon and folk hero Ned Kelly (portrayed by Canadian actor Frank Mills) from the late 1800s, who was a notorious outlaw (or "bushranger"). Today, only fragments of the film exist. 1906 Chicago's White Front Theater opened - the nickelodeon was future Universal Studios' head Carl Laemmle's first business venture into the film industry. He invested most of his savings in the rental and fix-up of an empty building on Milwaukee Avenue, and painted its facade white, naming it the White Front Theatre. Due to the theatre's instant success, quickly becoming the most popular in the city, Laemmle also opened up a second theatre called "The Family Theatre" and established the Laemmle Film Service - it soon became the largest film distributor in the country. 1906 Vitagraph (or American Vitagraph) Studios opened the first modern film studio in the US, built in 1906, in Brooklyn, NY, and for a short time, it was considered "the movie capital" of the world. 1906 The oldest and largest continuously-operated family-owned cinema chain are the Wehrenberg Theatres. The first of the theatres, the Cherokee Theatre (in St. Louis, Missouri) was set up in 1906 by former blacksmith Fred Wehrenberg. As of 2015, the Wehrenberg "family" still operates 15 movie theatres (with multiple screens) in Missouri, Iowa, Minnesota, and Illinois, and 9 theatres in the St. Louis metropolitan area. 1906 Edwin S. Porter directed the amusing fantasy film Dream of a Rarebit Fiend (1906), using trick photography. [The name was based on a Winsor McCay newspaper comic strip - McCay served as the film's writer.] It was the Edison Manufacturing Company's most popular film of the year. 1906 Biograph's dramatic short The Paymaster (1906) was noted for its creative use of available light, due to innovative filming by cinematographer G.W. "Billy" Bitzer. [Bitzer, later considered the greatest cinematographer of his time, would eventually shoot all of director D.W. Griffith's most important works.] The characters in a New England village were a heroine mill-girl, her love-interest - the mill's young paymaster, and the dastardly swindling villain who was superintendent of the mill. 1906 Pioneering motion-picture mass marketer Siegmund Lubin, a Polish immigrant, was expanding his chain of theaters, with film exchanges in Philadelphia, Cincinnati, and Norfolk. He was one of the first movie producers to control a film's production, distribution, and exhibition in a vertically-integrated business model. 1906-1908 About 5,000 nickelodeons existed throughout the United States. Many studios were created to keep up with the increased demand for films. In 1907, The Saturday Evening Post reported that daily attendance at nickelodeons exceeded two million. In 1907, the Chicago Daily Tribune denounced nickelodeons as firetraps and tawdry corrupters of children. Nickelodeons spread and numbered between 8,000 to 10,000 by 1908 with 200,000 customers a day, charging five cents for a movie accompanied by a piano.